Three Little Bears from Piano Town Primer Technic. Diane Hidy...This question is from my 5 year old student. The little guy is curious about the Three Bear Little Bears song on p. 3 of Piano Town Primer Technic. He is concerned that the two big bears are hurting the little bear. I told him I would find out. I am so happy to hear that you are thinking about the bears in such a kind and thoughtful way. Please rest assured that the picture you are speaking of is of a Mommy and Daddy bear and their little baby bear. They are taking good care of their child. Thanks so much for your concern. One of the most delightful things about being a composer/writer today is exchanges like these. People can easily message me and it's easy to communicate immediately. I especially enjoy these exchanges when the questions come directly from the students. These have become more common since I integrated an easy-email feature on my website. There's something so satisfying about hearing from real people using the products I've made. Sometimes, as a composer, it feels like one works so hard and the work goes out into the ozone of the world. I read everything that people send, and I appreciate it all. If you ever have a questions you want to ask, please do! It's ever-so-much-fun for everyone involved! 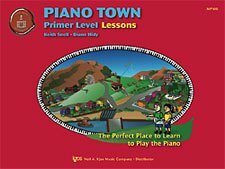 Would you like to learn more about Piano Town?